Its a good sign of biodiversity. When Ibrahim and Kamariah first set up Iskandar Inn about 12 years ago there were hardly any street lights and most of the area was still somewhat wild. Today, its a vibrant community dotted with nice houses, inns and places to eat. 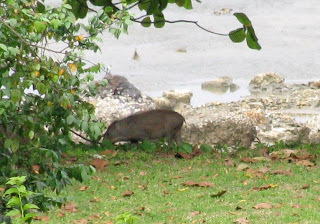 Its a good sign to see hornbills and wildboars still among us ! Nature is still with us ! Happy New Year and a Prosperous 2009 to all !